As Manuel Castells argues , "The network society is a global society because networks have no boundaries." While that may apply in cyberspace, the question of boundaries or borders in real, physical space is another matter. An article in today's Joongang Daily describes the outcry as China announced a new air defense zone. From Korea's perspective, the problem is that it's northeastern boundary overlaps with the Korean island of Ieodo, as shown in the accompanying graphic (click to see a full size versions). The article noted that "Seoul and Beijing have disputed the sovereignty of Ieodo, also known as Socotra Rock, a group of underwater reefs located 149 kilometers (92 miles) southwest of Korea’s southernmost Mara Island in the Yellow Sea. Effectively controlled by Korea, Ieodo is located 287 kilometers from China’s eastern Yushan Island in Zhejiang Province. 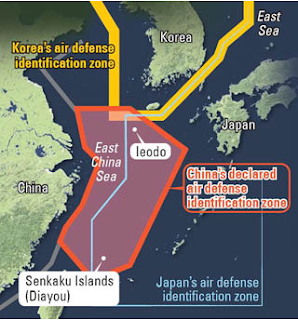 “We regret that China’s Air Defense Identification Zone overlaps with ours,” said Kim Min-seok, the spokesman of the Defense Ministry, “and we will negotiate with the Chinese so that this measure does not impact our sovereignty.” According to the Joongang Daily article, "Chinese Foreign Ministry spokesman Qin Gang responded at a briefing yesterday saying that he hopes China and Korea, as “friendly, neighboring countries, can solve the issue through dialogue and communication, and keep peace and security.” Qin added: “Ieodo is a rock submerged under water and so it is not considered disputed territory.”"